Russia is using its West-imposed “isolation” as a blessing in disguise to re-strengthen old strategic relations with friendly states across the globe. In that respect, the policy of economic sanctions encouraged by President Barack Obama and Prime Minister David Cameron could yet become the worst blunder in geopolitics. These sanctions have helped Russia, which this year chairs several multinational organizations, including BRICS, to realize that these groupings offer Moscow a strategic lifeline. Russian President Vladimir Putin emphasized ahead of the Ufa Summit which brought Brazil, Russia, India, China and South Africa together, that BRICS maintains “coinciding strategic interests” and wants to change the global monetary order which greatly depends on the US dollar. Among all the groundbreaking decisions made at UFA this year, hidden in almost a footnote, BRICS nations are moving to discard the dollar and euro on their $500-billion intra-trade. Coupled with the rapid acceptance of the Chinese Yuan (renminbi) as part of official reserve currencies, this momentum represents the first major threat against the dollar in decades. Putin also stressed that “we do not have any plans to form a BRICS military and political alliance”. A trained counter-intelligence officer, Putin seems to have kept his craft expertise and was able to purposefully downplay the Summit’s focus to just global economic governance even though the published agenda included Afghanistan, among others, as one of the many discussion points. The Summit itself also seems to have experienced isolation and sanctions by Western broadcasters with no major network covering it significantly despite Putin hosting 14 heads of states who were attending BRICS meetings as well as the 15th Shanghai Cooperation Organization (SCO) Summit in Ufa. At the SCO meeting, the regional grouping – composed of two BRICS members China and Russia, with regional states, Kazakhstan, Kyrgyzstan, Tajikistan, and Uzbekistan – inaugurated the inclusion of yet another BRICS nation, India as a full member. Afghanistan President Mohammed Ashraf Ghani also attended the meeting in what is a major thawing of relationships since the Soviet Union’s 1979 military invasion of the country. The SCO has also strategically pulled in Pakistan as a new full member, clearly muscling out of US hegemony of the India-Pakistan geopolitical complex. The SCO, often seen by analysts as a North Atlantic Treaty Organisation (NATO) equivalent, is fashioned after the G77 and the premise of the Non-Aligned Movement, which sharply contrasts with the Western military alliance’s philosophies. Within the SCO is a mechanism called the Regional Anti-Terrorist Structure (RATS), which coordinates operational security activities to combat terrorism and extremism; countries like Afghanistan, India, Russia and Pakistan need this apparatus the most. Bringing in new members India and Pakistan, therefore, is also one of the most important strategic expansions of the group’s efforts in light of the perceived anti-Pakistan orientation of the new leadership in Delhi. By building into India’s and Pakistan’s peace road-map their membership in SCO will create a good environment and background for improved relations and trust. Also in attendance was Iran – having been accepted by SCO as a prospective member; however, what stands in the way of the official membership are UN sanctions. With UN sanctions set to end if a nuclear deal is reached in Vienna, Iran too will become a full member of the SCO making this a formidable organization with reach into Western Asia. Russian Foreign Minister Sergey Lavrov in this regard aptly described the SCO as a major component of the new, “polycentric world order”. To have both BRICS and SCO in one town, Putin displayed grand mastery in presenting a bold alternative to the existing world order. Although Brazil and South Africa are non-SCO members, both countries will play a role in Russia’s strategic re-alignment to include most nations in Africa and South America. As Putin promised, there were no clear military alliance deliberated during the proceedings, but issues of conflict in Iraq, Syria, Libya, Afghanistan, ISIS, Al-Qaeda and even Ukraine were discussed. Declarations were made with BRICS condemning the Western sanctions against Russia on the matter of Crimea, and the ongoing war in Ukraine. With Africa featuring prominently on the BRICS agenda, South African President Jacob Zuma presented the continent’s bold industrialization framework and the crucial peace and security issues that are making headlines today. In that regard, BRICS came out strong on the Kenya terror attacks, Burundi, Mali, Democratic Republic of Congo, Central African Republic, and the Al Shabaab and Boko Haram Islamist terror groups operating in Africa. The inclusion of these wider global issues immediately positions BRICS as a new powerful political bloc with SCO as its likely proxy providing a strong military alliance. 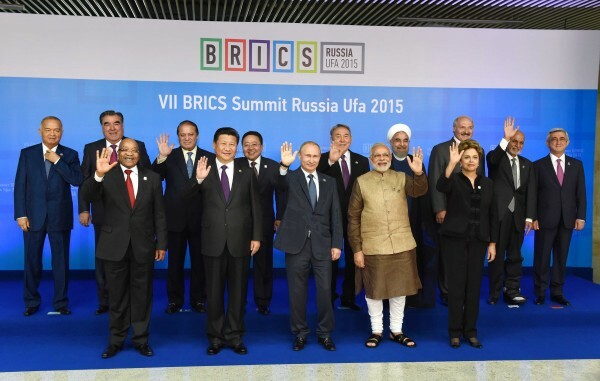 Further to this, the summits in Ufa, highlighted the geopolitical cross-pollination between BRICS and the SCO. As evidenced in the final BRICS declaration, the SCO cannot make decisions that are disadvantageous to BRICS and visa versa. The intractable connection of these organizations and others is now inevitable. One of the strongest statements in the 7th BRICS Summit Ufa Declaration urges Washington to fulfill its commitments regarding IMF reform. “We remain deeply disappointed with the prolonged failure by the United States to ratify the IMF 2010 reform package, which continues to undermine the credibility, legitimacy and effectiveness of the IMF,” the declaration states. It calls on the US to ratify the 2010 reforms by mid-September 2015 as agreed in the IMF. In what will be the lasting legacy of former IMF Managing Director Dominique Strauss-Kahn, the 2010 reforms aim to level the playing field amongst IMF members. In 2010, Strauss-Khan managed to get the IMF’s governors to vote by 95 per cent in favor of a package of far-reaching reforms of the IMF SDR (international reserve asset) quotas and its governance. The SDR is designed to supplement the official reserves of IMF members. BRICS statement on the matter was emphatic; “We reaffirm our commitment to maintaining a strong, well-resourced and quota-based IMF and, in this regard, urge other Members to continue the reform process through the 15th General Quota Review without delay,” the declaration states. The emphasis on the immediate implementation of these reforms bodes well for BRICS – particularly Brazil and South Africa, who will directly benefit – and other emerging economies. Reforming the world economic order has always been a BRICS mantra, and the five members looked ahead to the G20 2016 Summit to be hosted in China for the first time. In the hopes of diminishing Washington’s use of the G20 as a means of political influence, the BRICS declaration reiterated its commitment to strengthen International Financial Architecture and consolidate the role of the G20 as the premier forum for international financial and economic cooperation. This declaration is in line with previous resolutions of the G20 in particular in 2013 but its importance becomes clearer when considering illicit financial flows. In 2011, the African Union Conference of Ministers of Finance, Planning and Economic Development adopted a resolution mandating the establishment of a UN High Level Panel (HLP) on illicit financial flows to tackle the exit what some have said could be as much as $50 billion a year from Africa. With the G7 clearly out-dated and not representative of the emerging powers, the G20 remains the most representative organisation for coordination of global economic regulations. It is a well placed group to pressure the Western powers into transformation of the Bretton Wood institutions and the international monetary system – issues that have been central to BRICS goals. Bongani Mbindwane is a South African business leader and a geo-political analyst.